My new wrap dress! Photo by Robert the Husband. The dress was really comfortable to wear, but I might still add a snap at the V-neck where the sides cross. There was a tad of gaping when I was in the car wearing a seatbelt. I’m really glad I added the piping trim, otherwise all the design detail of this dress would have been lost in the print. As it is, the diagonal pleats are impossible to see. 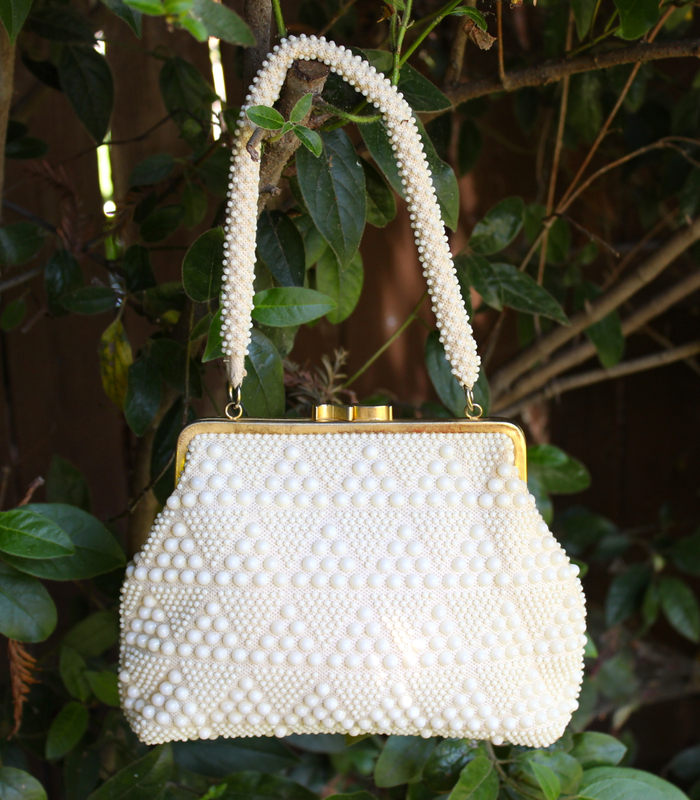 I bought this purse at the Sacramento Antique Faire for $5 or $10. Although I have a nice big quality leather purse (which I use for work meetings because it looks super professional and holds a full-size notepad), it’s really lovely to have a collection of small vintage purses. This one is big enough to hold a wallet, keys, phone, handkerchief and colored lip balm. What more does a girl need for brunch with her sweetie? 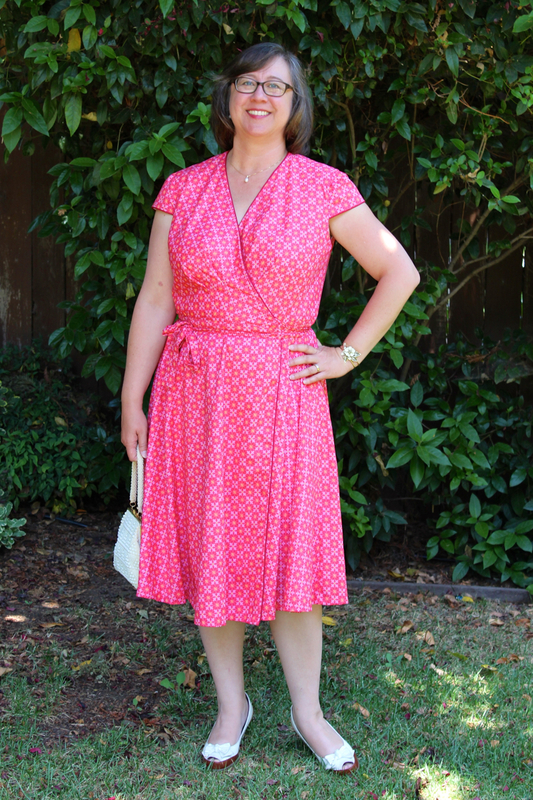 Next up: The Clara Dress from Sew Liberated. Congratulations on your anniversary. I completely agree about the piping. Looks perfect. Thanks so much, Ruthie. And thanks for stopping by! Congratulations on your anniversary! Wishing you many more happy years. Re: the coral dress–when I looked at it the first time I did not notice the piping. You were wise to add that piping–it makes the dress pop. I love detailing. Have you tried to sew down the cross over with a top stitching row. The neckline looks like it would fit over the head (like a pull over). Thank you! The top stitching is an interesting idea. I hadn’t thought about that, but you might be right. That would be a lot easier than bothering with a snap.